A book has just been published by Springer containing the data acquired over several decades on the PVY and presenting also the latest advances (published and unpublished). 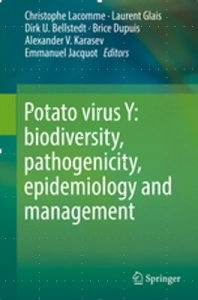 It was written by experts of the PVY/potato pathosystem, including Laurent Glais (FN3PT / UMT InnoPlant) and coming from different countries, backgrounds, and members of the PVYwide-organization consortium. Thanks to the comprehensiveness of the information presented, the covered subjects and the quality of the illustrations, this book addresses a wide audience interested in virology, ranging from the most experienced to the less experienced, to students but also to people closer to the agronomic industry (producers, agronomists), politicians, institutional bodies. PVY/potato interactions in relation to resistance and host barrier.